They drove 2,634 miles within 24 hours, non-stop. This is more than the distance between Daytona Beach Florida and Los Angeles California. Each team had three to four drivers taking shifts completing 740 laps around the Daytona International Speedway road course. 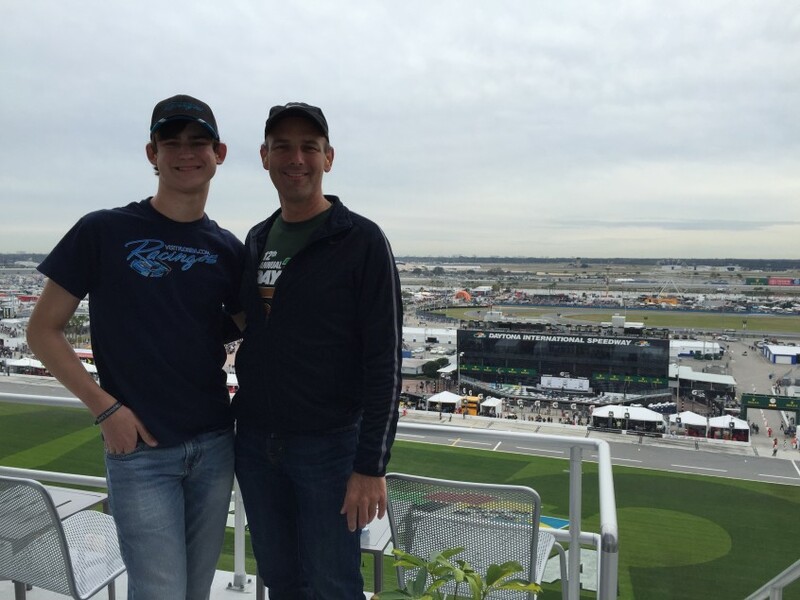 Meanwhile, my son, Robert William, and I enjoyed watching the race from brand-new suites at the speedway. We even took part in the buffet, which included a prime rib brunch and my favorite dessert: pecan pie with ice cream and caramel sauce. While we were eating and relaxing, the drivers were pushing their cars through each turn as fast as they could go. Each car has a team of drivers taking turns to push the car to its limits through each turn for 24 straight hours. In the end, after racing for a full day, only 1.33 seconds separated the winner from the first runner-up. Any slip-up on any turn for 740 laps could have turned the winner’s victory into a loss. My son and I did explore the track beyond the suite area. We traveled by golf cart around the course. The cars are fascinating to watch, especially as they race at night. To maximize speed around each corner, the driver waits to hit the brakes until the last possible second. When he slams on the brakes, they get so hot, you can see them glow in the dark. It’s fascinating to watch the drivers push their cars to the limit on every single lap. All of us experience times when we have to put every effort into our work — where letting up for even just a second can be the difference between success and failure. Years ago, within my association clients, I noticed we had a 90-95 percent renewal rate among those who had been members with us for two years or longer. However, the renewal rate for first-year members was 50 percent. We were letting up after a new member joined. We got their check and we got their membership, so we thought that was the end of the race. We were letting up, losing the race. I instituted a new policy for our employee incentive programs: Rather than focus on new members we began score-boarding members when they renewed their members for the first time. This changed everything. After the initial backlash, there was an intense focus on making sure the member was engaged, connected with other members, and offered the opportunity to invest in other products and services. Retention rates shot up, as did membership growth. Sometimes the race is long. Getting a member is not the same as keeping a member. Retention is the finish line that counts.